The planet Ketu is the south node, where as the Rahu is the head; Ketu is the body. Like Rahu, Ketu is said to exert tremendous influence on earth; including the human body. Like Rahu, Ketu also has an equal importance in traditional Indian astrology Ketu assumes the nature of the house which he occupies in the horoscope of the individual. Ketu is also an important component of the kaal sarpa yog ritual; the other being Rahu. 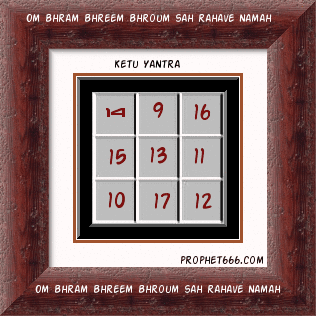 This is a Yantra representing the numerological vibratory values of Ketu.This Yantra is prepared to bring in the beneficial effects of Ketu. Sir,can we keep more than two astrological yantras with us. And do we need to make yantras on their particular days like Surya yantra on sunday, is it like that?